Who inspires me: My daughters. I always wanted to raise strong, kind, considerate, independent and funny women and that’s exactly how they’re turning out to be. Best advice: Kindness is free, sprinkle it everywhere. It was a sunny day as Rochelle Courtenay sat in her comfortable Queensland home scanning through the news on her computer screen. She scrolled through the items on the popular women’s website Mamamia, reviewing headlines, celebrity gossip and news. But Rochelle’s bright world darkened as one article glared from her computer screen. The article revealed the shame that seizes thousands of homeless women each month when they contract their menstrual period. With little money and no bathroom of their own, these women hide in public toilets and stuff newspapers and paper towels into their underwear in a fruitless bid to stem their menstrual flow. As someone who’d battled the trauma of heavy monthly flows with endometritis, Rochelle was horrified. Surely such indignity wasn’t happening in Australia? Surely this was a basic hygiene requirement for which these women could get help? Today Share the Dignity not only provides sanitary items to disadvantaged women, but also pays for the funerals of those killed through domestic violence, funds activities for children of domestic violence and lobbies for the rights of domestic violence victims and their families. Such is the impact the charity has had on disadvantaged Australian women, that Rochelle was named Cosmopolitan Humanitarian of the Year for 2016. Rochelle is quick to downplay the award, crediting it to the army of 1100 volunteers she has now gathered around her. This once every-day personal trainer and suburban mum now spends her days embroiled in some of the country’s most tragic circumstances. What drives Rochelle to dedicate so much of her life to helping women she has never met? 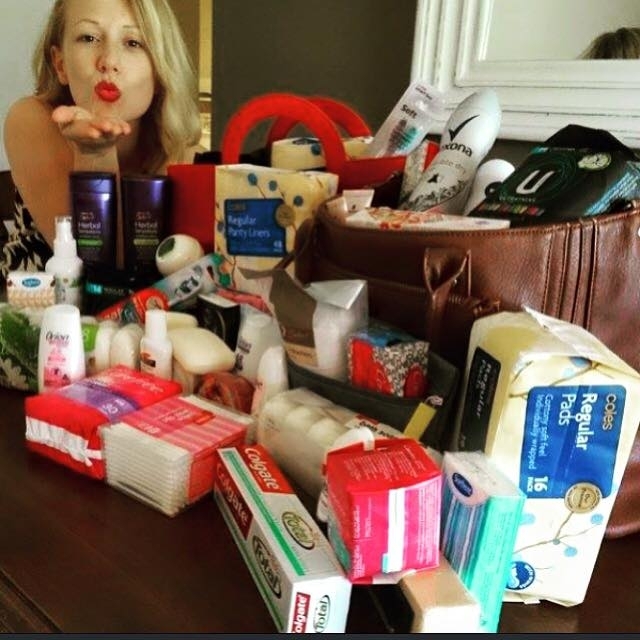 “I just thought I’d do that one drive [for sanitary items] and that would be the end of it,” Rochelle says. But several months after donating 450 packets of pads and tampons, Rochelle received a phone call from a friend who worked with victims of domestic violence. Did she have any sanitary pads left? No, but she could do a call out to those who’d helped before and see what they could collect. This time the drive went viral. Rochelle began fielding calls from all over Australia from women who wanted to help stockpile the nation’s biggest stash of tampons and pads to gift to women in need. One woman in Darwin worked at a service station and was saddened by the sight of desperate women stealing tampons, then shuffling to the bathrooms, a trail of blood in their footsteps, to stem the flow. Distraught at the sight, the woman turned a blind eye to the theft. Another woman called from Melbourne. She too wanted to help. There were calls from Sydney, Adelaide, everywhere. They started veranda collections, in which people would put a box on their veranda where others could donate pads and tampons. As the idea gained momentum Rochelle became swamped in requirements for licensing, permits, boards and constitutions. With the help of her fiance she formed a board. And the right people kept approaching her to help. A barrister and an accountant put up their hands to join the board. An academic with a PhD in world menstrual health looked her up. Who knew such a title existed? Yet they too soon joined the Share the Dignity team. “I surrounded myself with the people with the skills I needed to have,” Rochelle says. 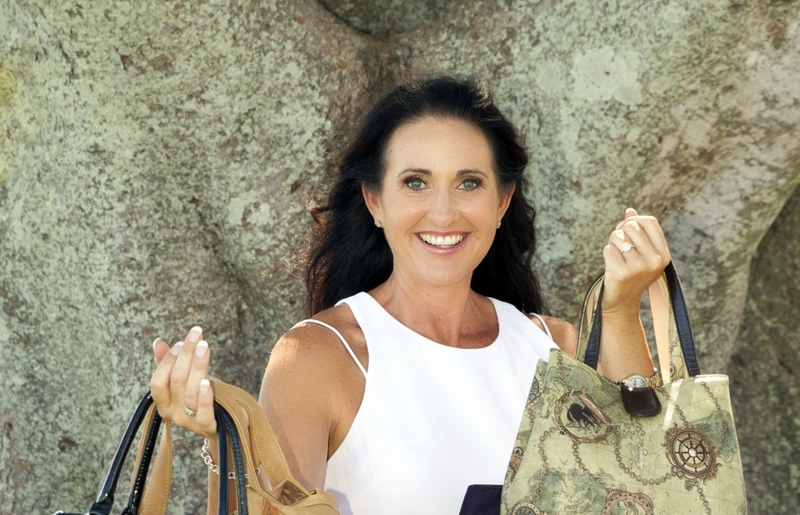 Rochelle showing off handbags that raise money for her cause. Today Share the Dignity runs two drives a year, through its partner Terry White Chemists, to provide sanitary packages year to 1500 charities across the country. It has launched two custom-designed tampon vending machines in areas that homeless women often frequent, to enable them to access sanitary products. So popular are the vending machines that they are now up for a design innovation award. Share the Dignity sells specially designed handbags to raise money for more sanitary items, and it packs bags with donated new and unwanted bathroom products such as shampoos and moisturisers to give to people in need. Goodies donated for women in need. 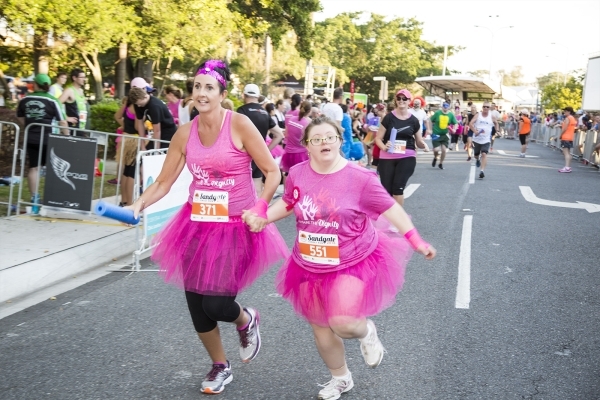 In 2015 Rochelle was manning a Share the Dignity stall at a Gold Coast Homeless Connect event when a 45-year-old woman approached her for help. “She asked me for pads and tampons and, when I gave them to her, she looked at me like I was fricken Santa,” Rochelle says. “I got talking to her and found out she had two kids who went to school and they were living out of their car on the Gold Coast.” After eight years of beatings from her partner, the woman had garnered the courage to leave, preferring life in the car to that of her violent home. She’d cook on free barbecues lining the Gold Coast foreshore, and shower herself and her kids in public bathrooms before sending them to school. She had no idea there were people she could call for help. “Her story made it really apparent how many homeless women were out there because of domestic violence,” Rochelle says. Rochelle again embarked on research. She discovered that Michelle’s case was no one-off. She learned that morgues won’t release bodies until they get the okay from the funeral home that the cost for the funeral is covered. Rochelle couldn’t shake the image of grieving families facing the added trauma of being unable to pay for the funeral of their loved ones. So Share the Dignity expanded its offerings and stepped up to pay for the funerals of people killed through domestic violence. Share the Dignity helps with cases like that of a little boy murdered by his father, after his father gained joint custody, despite the mother’s desperate warnings that her son wasn’t safe. Share the Dignity paid for the return of the boy’s ashes to his grieving mother, ensuring the ashes were delivered in the teddy bear urn his mother had requested. Share the Dignity also recently paid for the funeral of an Aboriginal woman killed through domestic violence in January, her body abandoned in the morgue for months because no one had the money to pay for the funeral of their loved one. And Share the Dignity stepped in during the case of the Therese Bradfield murder in Queensland – a case that shocked Rochelle, along with the rest of the country, when the mother of four was murdered after her husband was released on bail, confirming Therese’s terrified predictions that his release would result in her death. Rochelle and her friend Hannah, fundraising for the cause. Even before working with people like the Bradfield family, Rochelle had realised the extent of devastation they were left to deal with. And she felt so deeply for the children left to continue life without their mum. So Share the Dignity launched Activities 4 All, which funds sports, music and camps for kids affected by family violence. “Every day, in thousands of homes across Australia, children are exposed to domestic violence that will scar them for life,” Rochelle says. “They hide in their bedrooms or, being too afraid to move, they watch on as their mothers are beaten by abusive partners. By participating in healthy, positive, social activities where they feel cared for, these traumatised children are given a ray of hope that their futures can still be bright. It just gives them a chance to be a kid, to smile and laugh for a while.” One of Theresa Bradfields children has now taken up archery under the Activities 4 All scheme. Of course funerals and scholarships are not cheap exercises, and Share the Dignity remains committed to funding sanitary items as well. So it has ramped up its fundraising activities. 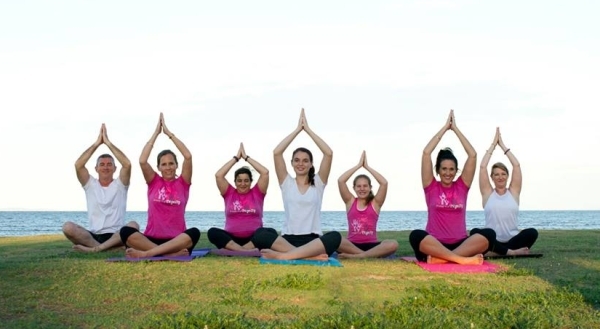 As well as selling Handbags with Heart to raise money, and conducting Dignity Drives, Share the Dignity now offers fundraising Yoga for Dignity events and ‘I Stand Up’ comedy nights. Help Share the Dignity continue its lifesaving work by visiting the website and seeing the various ways you can help make a difference.